On July 20th, Chinese e-commerce company Meili quietly submitted an SEC filing to list on the NASDAQ stock exchange in New York, seeking as much as $500 million for its next stage of growth. This comes just two years after Meili was formed from the merger of sister sites Mogujie and Meilishuo, who now have a combined user base of 200 million registered users and 15 million daily active users. Meili’s content-driven + livestreaming strategy has built a tightly-knit community of like-minded female shoppers between the ages of 18 and 23, holding its own in a category that has long been dominated by Alibaba’s Taobao: affordable apparel. Its unique model demonstrates how smaller players can build a niche by customizing the user experience to fit certain categories and user bases, in a way that larger competitors cannot. Mogujie was originally founded in 2011 by two ex-Alibaba executives as a shopping guide for young female users shopping on Taobao. The Pinterest-like site was heavy on photos and blog-like content, and was designed to help guide its users through their online shopping journey, helping them to discover new looks and find matching outfits. Webpages were linked to Taobao store pages, where users could complete their transactions. As Mogujie scaled and found more and more users looking towards its platform for recommendations, it started its own e-commerce business at the end of 2013, soliciting high-quality merchants and breaking away from Taobao. Mogujie then reduced its focus on content and focused all of its efforts on turning the site into an e-commerce platform, with its GMV reaching 3.6 billion RMB in 2014. But it found that its users were becoming less sticky and that it was becoming more and more difficult to differentiate itself from Taobao, which sold apparel at similar prices. So in 2015 it went back to its content + social roots, ramping up the amount of content on the platform and adding tools for merchants to reach out to and connect with users. Its transition included a shift from user-generated content to professionally generated content, notably adding a live-streaming feature for KOL influencers hired by merchants to show off the latest trends. This feature would later become the centerpiece of its community, with Mogujie setting up a KOL influencer matching platform that now enables merchants to choose from a selection of over 50,000 influencers. Livestreaming became the key to success for Mogujie, as it created a way for merchants to interact more closely with their customers and cultivate a loyal fan base through KOL influencers. The livestreaming shows involve influencers trying on different clothes and providing colorful commentary, so that viewers can get a sense of the clothes’ overall look and feel, as well as how each item can match up with others. In a step up from QVC-like TV infomercials, users can interact with each other and the hosts by typing instant messages, asking questions about the fit, whether they have different sizes or colors, what to complete the look, etc. It is different in that the conversation is often driven by the audience, not the presenter; this creates a much stronger sense of involvement and trust, which helps facilitate the purchasing process. To make the experience seamless, in March 2016 Mogujie embedded a purchasing feature within the user interface so that users could complete transactions without having to leave the livestreaming show. Clothing items are displayed on the left-hand side and users just need to select the color and sizes before approving the transaction. On average, users stay in a live-streaming room for 40 minutes, an indication of the allure of these influencers. Today Mogujie livestreams 800 shows a day, with some shows generating as much as 800,000 RMB in transactions in a day. While typical e-commerce platforms are designed to help large numbers of users make quick purchases, Mogujie’s livestreaming experience was designed to provide a more interesting, if convoluted, shopping journey. Livestreaming provides an online shopping assistant and community that users can go to when looking for advice on what to wear. When these users are online, they may or may not already have something to buy in mind, and could just be browsing for fun, a situation similar to that of an offline retail shopping experience. In this type of situation, shoppers aren’t in a rush and are looking for a more fun, interactive experience that enables them to discover new looks and find clothes that really fit their style. By enabling transactions during livestreaming shows, Mogujie facilitated the final leg of the shopping journey, making it easy for customers to make purchases once they were finally ready to. Mogujie was one of the first e-commerce players to take advantage of the WeChat mini-program feature. Launched in mid-2017, its mini-program quickly acquired 500,000 users within its first twelve days of launching, and this quickly grew to 90 million within half a year. Of these users, 20 million made purchases, a conversion rate double that of its standalone mobile app. During Singles Day 2017, its livestreaming mini-program caused transactions to reach 30x that of the year before. Today, Mogujie reportedly has around 35 million MAUs. How did Mogujie’s mini-program acquire so many users, in such a short amount of time? Though WeChat’s nature as a social media platform makes it easier for users to share content and products with one another, it is still a closed platform in that users cannot see or interact with users who they are not connected with. In this sense, users have to be compelled to share their shopping experiences within their closed group of friends and family, who are likely to have similar preferences. Mogujie did this by giving cash rebate offers to users who successfully shared products and purchases with friends and family, which is how it grew its user base to 500,000 within the first twelve days of launching. Mogujie also introduced group-buying promotions, which gives discounts to users who are able to pull in friends and family to make a joint purchase. Group-buying contributed to 70% of new purchases during the mini-program’s early days. This solved the user acquisition problem that many mini-programs tend to have, and the live-streaming and editorial content embedded in the mini-program kept users coming back for more. While Taobao has been successful with its own live-streaming features as well, due to Alibaba’s rivalry with Tencent, Taobao links are banned from WeChat and thus far Taobao has not set up a mini-program on WeChat. In early 2018, Mogujie’s parent company Meili was the latest to join JD.com’s borderless retail alliance, inking a strategic partnership that involves the two working together on a mini-program marketplace, WeShop. The WeShop marketplace mini-program links to mini-programs set up by individual merchants, and is designed to provide merchants with access to WeChat’s and JD.com’s large user base. It has a prime location on JD.com’s mini-program, and its social-network like interface mirrors that of Mogujie’s. Launched just after this year’s Chinese New Year, it sells a variety of different types of goods, as JD.com/Meili attempt to compete against Alibaba in general merchandise. Thus far, it has already reached an impressive 260,000 merchants, although GMV has yet to be disclosed. Nevertheless, this strategic partnership demonstrates how both JD.com and Meili plan to use WeChat mini-programs to expand into other verticals. Mogujie’s success in defending its turf against Alibaba and Taobao shows that it is possible for a smaller, vertical-focused player to hold its own against bigger, well-funded players in China e-commerce. What’s important is that retailers must find a way to connect with their target customers and curate a highly loyal, sticky user base that will keep coming back for more. 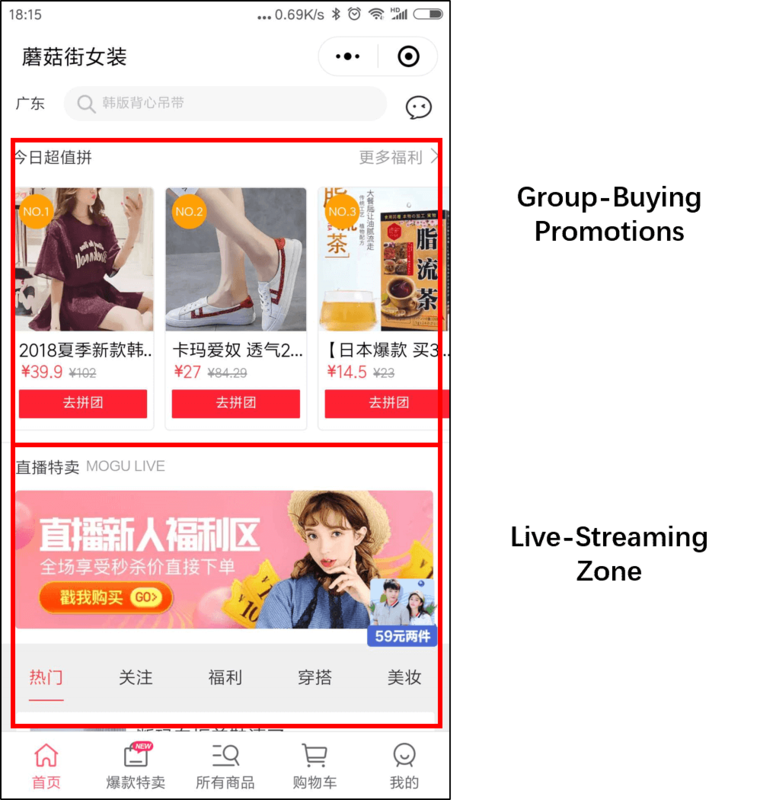 Mogujie took the content-driven model and took it one step further by doubling down on KOL influencers and live-streaming, leveraging the WeChat mini-program and social commerce tactics to quickly acquire new users. Today, Mogujie is expanding into maternity & baby products, and its mini-program marketplace venture with JD.com indicates its ambition to continue its expansion going forward.